The UK’s exit from the European Union is just four months away. As politicians continue to squabble over how best to proceed, companies are taking serious precautions. The latest: stockpiling wine. 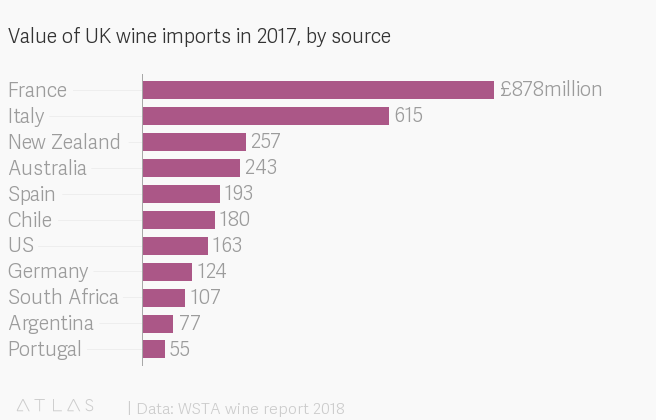 Despite a burgeoning English wine industry, the UK still imports 99% of the wine it consumes, and most of it comes from Europe. In 2016, drinkers in the UK bought nearly £14 billion worth of wine, or roughly 26 bottles per person, according to market research firm IWSR. The UK and EU may have agreed in principle to a Brexit withdrawal agreement and plans for future ties, but UK politicians are unhappy with the terms, and there’s a high chance that they will be voted down in parliament before the end of this year. Without legislative support, the UK could crash out of the EU and lose all its current trade benefits at the end of March—commonly referred to as the “no-deal” scenario. With customs checks expected to lead to huge delays at the border, many companies are making plans to stockpile the goods they need. The UK is running out of food warehousing space as companies including Mondelēz International, Premier Foods, and Ornua said they planned to store extra food, while pharmaceutical companies have also said they will be stockpiling medicines. As for the government, the prospect of a no-deal exit has prompted it to consider a flotilla (paywall) to avoid shortages of perishable food and medicines. Many question the practicality (paywall) of this plan, which would require chartering ships and sending them to different ports. Just under a third of food consumed in the UK is imported from the EU. The UK wine industry is already going through a tough time. Wine sales by volume are falling, according to the latest data from the Wine and Spirit Trade Association, partly because of the increased popularity of gin and fewer sales to restaurants as high street outlets close. A big part of the problem is the sharp deterioration of the pound since the Brexit vote has increased the cost of imports and pushed up prices. As businesses prepare for Brexit, there has already been a 13% decline in EU imports of wine in 2017 from a year earlier. Majestic’s share price dropped 14% yesterday as it reported a pre-tax loss of £200,000 ($256,000) in the six months to October, compared to a profit of £3.1 million (nearly $4 million) in the same period a year earlier.